Are you brave enough to jump into a snake infested pond? Well, it’s not like you will be jumping here with no protection, you got an SUV and all you need is to dump it on the pond like a boss. Well, these rednecks are so into it and this is exactly what are we about to witness in this video. They got their badass Ford Explorer SUV and they attempted to jump on the muddy and “snake infested” pond. Well, doing such stunt might be pointless yet surprisingly fun! We’re just wondering how come no single snake showed up after that huge splash! Nevermind, this redneck surely made your day! This Blown Mustang Performs Some Pretty Impressive Rolling Burnouts! 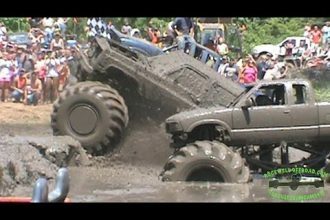 Check Out These Monstrous Trucks Digging Mud The Wildest Way!